Drag within the image to explore Slieve Gullion in virtual reality. This seven-node VR begins across the valley from the mountaintop tombs. Click here for the tablet version. This mountaintop plateau might have been conjured out of pure pixels, from the imagination of a Hollywood set designer. 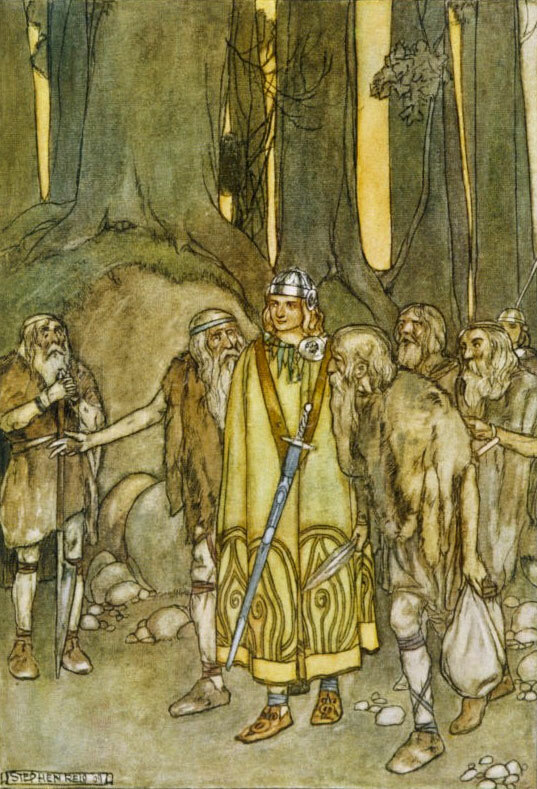 Who else might have put a magical lake on the summit of a mountain, with a dragon lurking in its depths, mysterious prehistoric burial mounds at each end, the larger one the home of a legendary witch, who matched wits there with the fabled Irish warrior Fionn Mac Cumhaill (Finn McCool)? 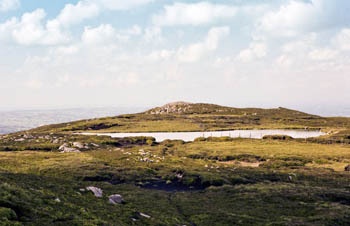 Slieve Gullion, at 573 m (1,894 ft) the highest point in Co. Armagh, is the long-eroded remnant of a primordial volcano. Nearby, at the Gap of the North, according to the Táin Bó Cuailnge, the hero Cúchulainn single-handedly defended his Ulster armies from the forces of Queen Medb.2 The area’s historic features can be explored on a 15 km (9.3 mi) hike, or the less athletic visitor can drive up most of the distance on the meandering Slieve Gullion Forest Park drive, stopping and parking at its highest point for a much easier half-hour trek to the top. 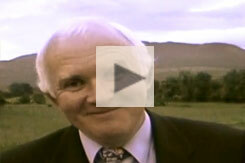 Kevin Murphy recounts the legend of Finn MacCool and the Hag of Beare that takes place atop Slieve Gullion (1998). The virtual-reality environment (left) begins with a view of the mountaintop from a few miles away, near the village of Forkhill. 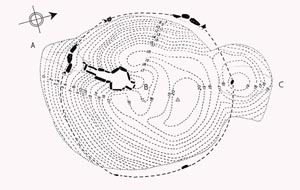 Hotspots lead to the passage tomb at the south of the plateau (Calliagh Berra’s House), its interior, and ultimately to the lake and the north tomb. From the position atop the passage tomb a hotspot can switch the camera to a telephoto view, from which the distant landscape—from the Mountains of Mourne to the peaks of Donegal—may be appreciated. The Loughcrew Passage Tombs (Slieve na Calliagh) to the southwest in Co. Meath may also be noted on the horizon. “Finn was one time out on the green of Almhuin, and he saw what had the appearance of a grey fawn running across the plain. He called and whistled to his hounds then, but neither hound nor man heard him or came to him, but only [the hounds] Bran and Sceolan. He set them after the fawn, and near as they kept to her, he himself kept nearer to them, till at last they reached Slieve Cuilinn, in the province of Ulster. But they were no sooner at the hill than the fawn vanished from them, and they did not know where she was gone, and Finn went looking for her eastward, and the two hounds went towards the west. 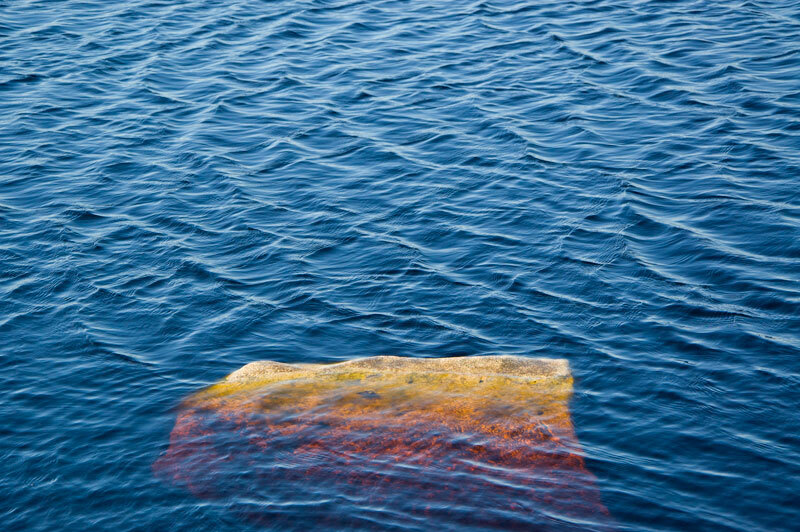 With that Finn stripped off his clothes and went into the lake at the bidding of the woman, and he went three times round the whole lake and did not leave any part of it without searching, till he brought back the ring. 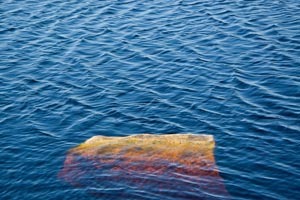 He handed it up to her then out of the water, and no sooner had he done that then she gave a leap into the water and vanished. And when Finn came up on the bank of the lake, he could not so much as reach to where his clothes were; for on the moment he, the head and leader of the Fianna of Ireland, was but a grey old man, weak and withered. Bran and Sceolan came up to him then, but they did not know him, and they went on round the lake, searching after their master. The north cairn and Hag’s Lake. Local schoolteacher Kevin Murphy in the 1998 video, above right, tells an abbreviated version of this story, with a twist at the end. In Old Irish, the original form of the hero’s name was Find, which is first noted in a text that may date from as early as the sixth century. By then he was thought of as a historical figure, with a rich oral tradition. He may have his roots in a divine figure of wisdom for the ancient Celts, which may explain the origin of his signature magical feat—his ability to gain knowledge by biting on his thumb.13 The Fionn of legend may have evolved from an ancient child deity, as stories were invented to explain the seeming incongruity of a great warrior making use of a childhood practice—putting the thumb in the mouth—in order to access his special magical knowledge.14 In one story his magical vision is thwarted when Diarmuid, who steals away with Fionn’s intended bride, Gráinne, hides from the great warrior’s extra-sensory perception by sleeping each night under the capstone of a dolmen. 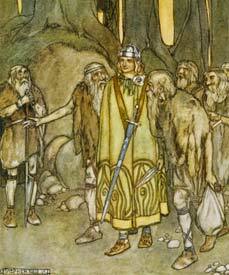 In many localities such a monument is known as Leaba Diarmuid agus Gráinne (Diarmuid and Gráinne’s Bed). He was a king over every country! He was a wise man in every skill! With the sky reflected on its surface, and its deep-amber peat-colored water, the lake can seem full of magic. 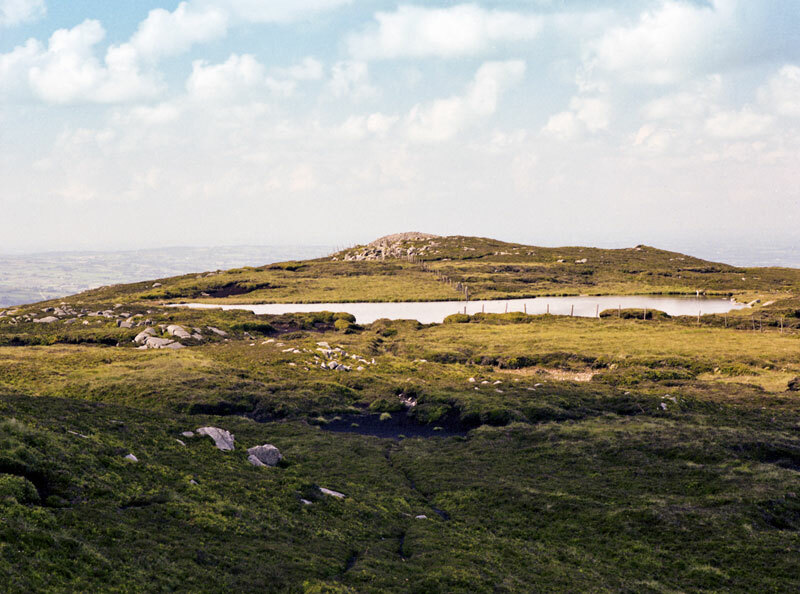 Two hundred years after the passage tomb at the summit of Slieve Gullion was ransacked by treasure-seekers, the cairn was further disturbed by American soldiers training there during the Second World War. 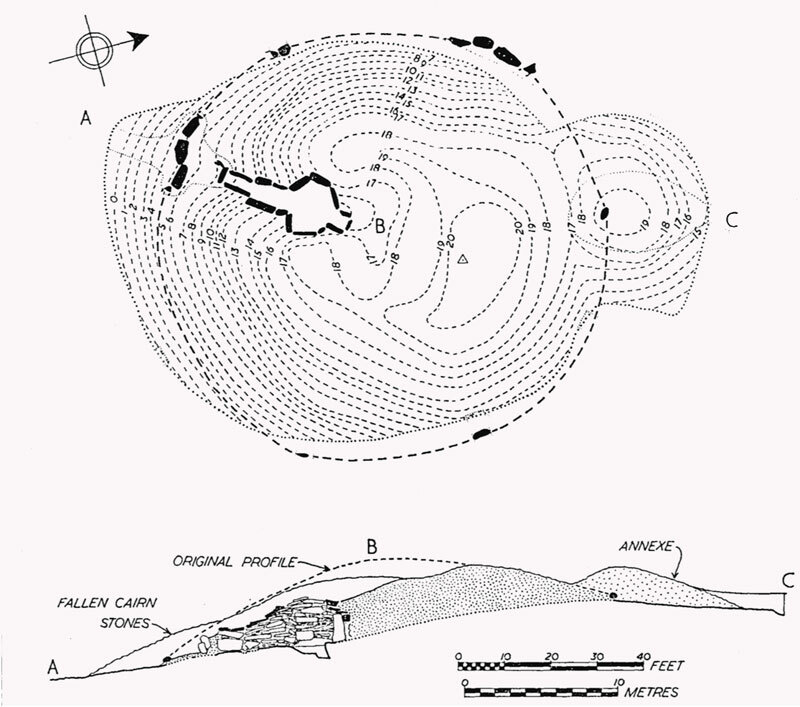 Foxholes were dug into the passage tomb and into the smaller cairn at the north end of the lake.20 In an 1804 report, the surveyor could not enter the passage tomb to explore its interior. They found the chamber to be 3.66 m (12 ft) wide, with a corbelled roof as much as 4.3 m (14 ft) above them, which has now mostly been replaced by concrete slabs. The outside diameter of the cairn is 30 m (97 ft), with a height of 5 m (16 ft). An “annex” cairn was found on one side, added after the construction of the main cairn. They discovered in the center of the passage tomb two large blocks of stone, evidentially used as basins, with shallow depressions hammered into their natural shapes. An earlier investigator had found a third, smaller basin, cracked into two pieces. These may be seen here in a drawing by the excavators. 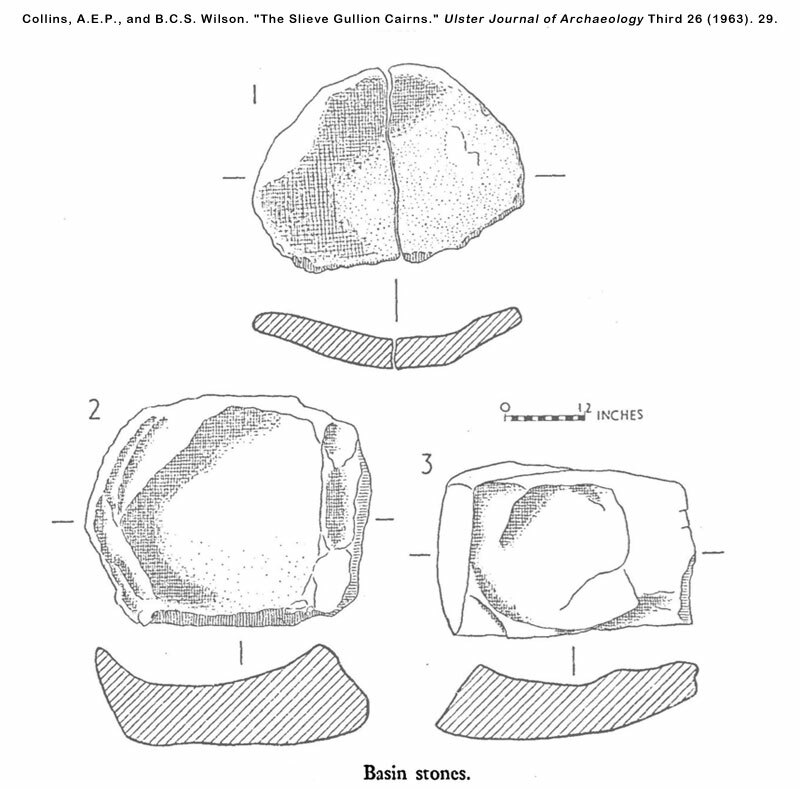 Some pieces of worked flint as well as a barbed-end arrowhead were also discovered, the meager remnants that survived the centuries of tomb raiding.24 Radiocarbon dating from the tomb’s excavation suggested its construction dated from c. 3500-2900 BCE. 25 The entrance to the tomb is aligned with the sunset of the winter solstice. Photographs of the event on December 23, 2011 may be seen here. The smaller cairn, to the north of the Hag’s Lake, is of later, perhaps Bronze Age construction. Not a passage tomb, it instead was found to contain two cist burials, with one containing fragments of burnt bone, likely the remains of a single adult individual. Some sherds of food vessels were also discovered,26 as well as brass cartridges tossed in by the occupants of the tomb’s foxholes during the war. While the allied soldiers using the tombs in the 1940s may have had no such worries, local folklore provides any number of accounts of bad fortune befalling those who came too close to the Calliagh Beara’s House on the top of Slieve Gullion. In his 1945 collection of tales from Armagh, T.G.F. Paterson related how people saw lights on the top, with “wee people” “desporting themselves round the bonfires.”27 The lake was reputed to contain a fearsome dragon, which would travel between there and the King’s Stables more than 30 km (18.6 mi) away by means of a hidden passageway. In the VR environment a hotspot in the lake permits this magical transport to the King’s Stables site.